WIRED DIRECTLY INTO THEIR NERVOUS SYSTEM, THIS REMARKABLE ROBOTIC HAND WILL SOON ALLOW ONE AMPUTEE TO ACTUALLY TOUCH AND FEEL THINGS AGAIN. About 50% of amputees don’t use their prosthesis because of relatively basic issues of design--comfort, aesthetic, and controllability. This has led inventor Dean Kamen to famously lament about humanity’s inability to offer our amputees anything better than “a hook on a stick.” Put in those terms, the lack of innovation makes your stomach churn. But soon, a new bionic hand made by Prensilia may change that. Through a highly experimental test surgery, in a project led by Dr. Silvestro Micera of the École Polytechnique Fédérale de Lausanne (EPFL) in Switzerland, the prosthesis will be wired directly into one test patient’s nervous system, which should enable movement through thought alone, along with the ability for the patient to actually feel what touches his or her mechanical hand. The story almost sounds too amazing to be true. But the upcoming surgery is actually a follow up to a 2009 study in which a simpler, fixed model of the hand was wired into a man’s nervous system to provide a sense of touch. It only had basic sensors embedded in the palm, but the patient was able to wiggle his fingers and feel pricks of a needle. Now, the latest wave of hardware and software technology will enable the transplant of a fully articulating, bionic hand (with sensors distributed in each fingertip, the palm, and the wrist). It’s also built with an improved interface that should permit multiple feelings and gestures at once, while the 2009 hand had an extremely limited bandwidth. That patient will wear the hand for just a month before it’s removed, and then two years later, they’ll receive a more permanent, polished version of the technology. The human hand has always seemed like an invention that only nature could have made over the course of billions of years. Strong enough to crush an orange, deft enough to thread a needle, we’re downright lucky to be born with a pair of the most perfect tools that respond to our every whim. But it’s their ability to feel that elevates them from another tool to part of us, that enables the thousands of tiny compensations we make all day as we interact to the world with softness and force. That’s why this single invention and single surgery is so exciting--it could solve one of the ultimate human-factor issues in medicine. And better still? Researchers say if all goes well, we’ll see widespread clinical adoption of such prostheses in the not-so-distant future. COMMENTARY: Prensilia's amazing robotic hand is the closest thing to a real hand by allowiing amputee's to actually feel what they touch. The sense of touch has been missing from artificial limbs and hands for a long time, and finally it looks like we have overcome that weakness. I don't know how much that Prensilia robotic hand will cost, but I have a feeling that it will be relatively expensive until the company can produce them at scale. Hopefully, federal gencies like Medicare and Medicaid will cover all or most of the cost. The world needs this product because it fills such a huge need among disabled amputee's. (September 27, 2010) -- Rice University physicist Dmitri Lapotko has demonstrated that plasmonic nanobubbles, generated around gold nanoparticles with a laser pulse, can detect and destroy cancer cells in vivo by creating tiny, shiny vapor bubbles that reveal the cells and selectively explode them. The nanobubbles have been tested in theranostics with live human prostate cancer cells, without harming the animal host. A paper in the October print edition of the journal Biomaterials details the effect of plasmonic nanobubble theranostics on zebra fish implanted with live human prostate cancer cells, demonstrating the guided ablation of cancer cells in a living organism without damaging the host. This is not the first time Rice University has used nanotechnology to advance cancer detection and destruction. Lapotko and his colleagues developed the concept of cell theranostics to unite three important treatment stages -- diagnosis, therapy and confirmation of the therapeutic action -- into one connected procedure. The unique tunability of plasmonic nanobubbles makes the procedure possible. Their animal model, the zebra fish, is nearly transparent, suiting in-vivo research. Plasmonic nanobubbles: laser pulse and plasmonic nanoparticle-generated transient event with tunable optical and mechanical properties. Physical and optical properties of plasmon nanoparticles at high temperatures and in multi-phase environment. Methods for imaging and characterization of plasmon nanoparticles. Interaction of plasmonic nanobubbles with living cells and tissue. 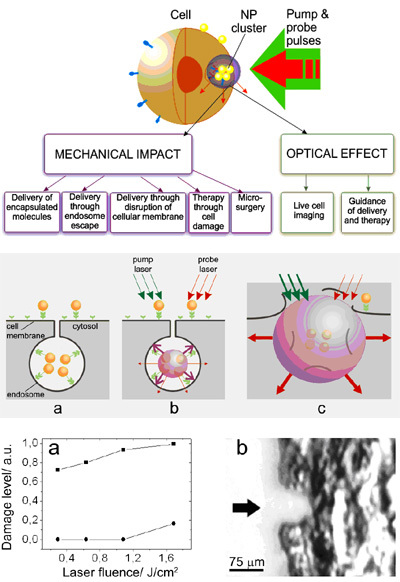 Cell theranostics: dynamically tuned intracellular plasmonic nanobubbles combine diagnosis (through optical scattering), therapy (through mechanical, nonthermal and selective damage of target cells) and optical guidance of the therapy into one fast process. High-sensitive imaging and diagnosis of cells with plasmonic nanobubbles that may provide up to 102-3-fold increase in sensitivity compared to gold nanoparticles and 105-6 fold increase in sensitivity compared to fluorescent molecules. Targeted therapy with plasmonic nanobubbles: LANTCET (laser activated nano-thermolysis as cell elimination technology). Applicastions: treatment of leukemia and of superficial tumors. Controlled release and intracellular delivery of therapeutic and diagnostic agent into the cells. Methods for imaging plasmonic nanoparticles in living cells and in tissue. Micro-surgery with plasmonic nanobubbles: recanalization of occluded coronary arteries. The National Institutes of Health has recognized the potential of Lapotko's technique by funding further research that holds tremendous potential for the theranostics of cancer and other diseases at the cellular level. Lapotko's Plasmonic Nanobubble Lab, a joint American-Belarussian laboratory for fundamental and biomedical nanophotonics, has received a grant worth more than $1 million over the next four years to continue developing the technique. In earlier research in Lapotko's lab in the National Academy of Sciences of Belarus, plasmonic nanobubbles demonstrated their theranostic potential. In another study on cardiovascular applications, nanobubbles were filmed blasting their way through arterial plaque. The stronger the laser pulse, the more damaging the explosion when the bubbles burst, making the technique highly tunable. The bubbles range in size from 50nm to more than 10um. A second, stronger pulse generated larger nanobubbles that exploded (mechanically ablated) the target cell without damaging surrounding tissue in the zebra fish. Scattering of the laser light by the second “killer” bubble confirmed the cellular destruction. That the process is mechanical in nature is key, Lapotko said. The nanobubbles avoid the pitfalls of chemo- or radiative therapy that can damage healthy tissue as well as tumors. "It's not a particle that kills the cancer cell, but a transient and short event," he said. "We're converting light energy into mechanical energy." Lapotko's co-authors on the Biomaterials paper are Daniel Wagner, assistant professor of biochemistry and cell biology; Mary “Cindy” Farach-Carson, associate vice provost for research and professor of biochemistry and cell biology; Jason Hafner, associate professor of physics and astronomy and of chemistry; Nikki Delk, postdoctoral research associate; and Ekaterina Lukianova-Hleb, researcher in the Plasmonic Nanobubble Lab. COMMENTARY: Nanotechnology was the rave about ten years ago, and a lot of VC's got into it, but a lot of that nanotech research went for not, and none of those startups ever turned into the next GenenTech. In fact, nanotech remains most in the laboratory, with little monetization. The claims that nanotechnology would lead to nano medicines or "nano robots" that would be used to repair tissues and kill bacteria and viruses sounded like so much science fiction. Rice University's in vivo research with plasmonic nanobubbles could make be the turning point. When I read about this Rice University research into plasmonic nanobubbles that can attach themselves to cancer sells and kill them, it reminded me me of those mechanical tentacled drones in the Matrix movies that attached themselves to the hull of Morpheus' ship the Nebuchadnezzar, I just had to look into it further. Current cancer treatment is highly invasive and uses hyperthermia (using high temperatures to destroy cancerous cells, also called thermotherapy), radiation or chemotherapy to destroy cancerous tissues resulting in painful and uncomfortable after-effects. Plasmonic nanobubbles kills cancer cells in a three step process called cell theranostics that combines three important treatment stages -- diagnosis, therapy and confirmation simultaneously. Present day cancer treatment involves various tests including a biopsy to determine if a patient has cancer. Cell theranostics using plasmonic nanobubbles can greatly reduce treatment times in one step. I would use the analogy of a multiple head heat seeking guided missile that "locks in" on multiple targets simultaneously, in this case the cancerous cells, and uses plasmonic nanobubbles (the warheads) to destroy the cancer infected cells. Plasmonic nanobubbles is still very early in the research and development stage, and more in vivo tests need to be completed, including tests on human beings, then cell theranostics using plasmonic nanobubbles needs to be approved by the FDA, before becoming an approved method for the treatment of cancer. Bacterial resistance to antibiotics is a growing problem, particularly for hospitals. Of particular concern for hospitals are Gram-negative bacteria, which have a two-layered cell wall that makes them especially resistant to existing drugs. As a result, start-ups with potential treatments for Gram-negative infections are now hot targets for venture investors and corporate acquirers. Among them is Rampex Pharmaceuticals, a San Diego-based startup which VentureWire reports has now raised up to $76 million in venture capital for a novel approach to fighting the problem. Rampex Pharmaceuticals hasn’t said how its internally discovered drugs work or whether or not they fall into an existing class of antibiotics. But Chief Executive Daniel Burgess said his company’s drugs will be effective against multiple Gram-negative bacteria that now escape the effects of today’s antibacterials. Various types of drugs, such as beta lactams, aminoglycosides and fluoroquinolones, are now used against Gram-negative bacteria, but resistance is a problem for antibiotics in each class, according to Burgess. The conditions Rampex could target include intra-abdominal infections and complicated urinary-tract infections, he said. The company said it expects to file for U.S. approval for its first product in the second half of 2012 and to seek approval to begin clinical studies of its second drug early next year, but Burgess didn’t give further details. A 2009 Centers for Disease Control and Prevention report said the overall annual direct-medical costs of hospital-acquired infection in U.S. hospitals ranges from $28.4 billion to $33.8 billion and $35.7 billion to $45 billion, depending on the Consumer Price Index adjustments used to account for the rate of inflation in hospital resource prices. Seeing opportunity in this problem, pharmaceutical companies are showing more interest in antibiotics after years of favoring drugs for chronic problems. Last year, for example, an anti-infectives spinout from Sanofi, Novexel, was acquired by AstraZeneca in a $505 million deal. In late 2009, Cubist Pharmaceuticals acquired venture-funded Calixa Therapeutics to secure access to an intravenous therapy for certain Gram-negative infections in the hospital. Meanwhile, private drug companies in this field such as Achaogen and Tetraphase Pharmaceuticals have raised large venture rounds. COMMENTARY: With annual sales of over $26 billion, antibiotics represent one of the largest therapeutic categories from a revenue perspective. Each year, almost 2 million Americans develop hospital-acquired infections such as sepsis and pneumonia, and over 95,000 of those infections resulting in patient death. The growing problem of drug-resistant bacteria will continue to drive growth in new and expanding market opportunities. Gram-negative bacteria are bacteria that do not retain crystal violet dye in the Gram staining protocol. In a Gram stain test, a counterstain (commonly safranin) is added after the crystal violet, coloring all Gram-negative bacteria with a red or pink color. The test itself is useful in classifying two distinct types of bacteria based on the structural differences of their bacterial cell walls. Gram-positive bacteria will retain the crystal violet dye when washed in a decolorizing solution. The pathogenic capability of Gram-negative bacteria is often associated with certain components of Gram-negative cell walls, in particular, the lipopolysaccharide layer (also known as LPS or endotoxin layer). In humans, LPS triggers an innate immune response characterized by cytokine production and immune system activation. Inflammation is a common result of cytokine (from the Greek cyto, cell and kinesis, movement) production, which can also produce host toxicity. Lipoproteins are attached to the polysaccharide backbone. Acinetobacter baumanii (which comes under Nosocomial Gram negative bacterial group). One reason for this division is that the outer membrane is of major clinical significance: it can play a role in the reduced effectiveness of certain antibiotics, and it is the source of edotoxemia in which endotoxin (a toxic substance associated with bacterial cell wall or core) comes in contact with bloodstreams and gets mixed with blood. Once the endotoxin is mixed in blood, it becomes very hard to stop the toxic substance from harming/destroying healthy tissues and also causing inflammation of the tissues. The substance can reach any part of the body and start to harm the tissues. The Gram negative bacteria can be killed using medication but the endotoxin is very hard to clean from the blood. Mycoplasma are sometimes considered gram negative, but because of its lack of a cell wall and unusual membrane composition, it is sometimes considered separately from other gram negative bacteria. Gardnerella is often considered gram negative, but it is classified in MeSH as both gram positive and gram negative. It has some traits of gram positive bacteria, but has a gram negative appearance. It has been described as a "gram-variable rod". Stroke patients striving to walk normally may get a lift from a bionic leg developed by venture-backed Tibion Corp. Many stroke survivors have weakness on one side that impairs their gait. Tibion’s device, worn around the leg during physical therapy, supplies the power needed to stand or walk, and may enable more intense therapy sessions. As strength and control returns, it assists the leg less. Tibion, which has placed the device in 10 U.S. rehabilitation centers since launching it in January, soon intends to close a $15 million Series B round to expand the rollout, said Chief Executive Charles Remsberg. Previous backers include Claremont Creek Ventures and Saratoga Ventures. The company’s product, the first of its kind, targets a large problem. Stroke, in which blood stops flowing to the brain, affects 795,000 Americans a year, according to the American Heart Association. A leading cause of long-term disability, stroke costs the U.S. about $70 billion annually in direct and indirect expenses, including health-care services, medications and missed work. Early research suggests that Tibion’s device could reduce patients’ dependence on health services by helping them recover their ability to walk, drive and live independently. A study at New York Presbyterian Hospital could supply more hard evidence. The trial is comparing 12 patients receiving conventional therapy to 12 rehabbing with the bionic leg’s added boost, according to Remsberg, who said he is talking with universities and the U.S. Department of Veterans Affairs about additional studies. Stroke survivors with “hemiparesis,” or muscle weakness on one side of the body, initially have little movement in one leg, so therapists traditionally have done most of the work to get the limb moving. Tibion aims to shift the effort to the patient. “We’re making it possible for the patient to work more intensively with the affected leg,” Remsberg said. On a recent morning at Whittier Rehabilitation Hospital in Bradford, Mass., patients performed sit-to-stand drills and other exercises with the robot’s help. One patient, a 63-year-old man, said he needed help to get out of bed shortly after his stroke, but has improved with therapy. How much the bionic leg contributed to his recovery is not entirely clear, but scientists suspect the device helps stroke survivors to form new neural connections to compensate for the ones they lost. By enabling them to work their leg more, the robot appears to help magnify afferent, neural signaling that reawakens the brain to the limb’s presence, Remsberg said. Tibion’s has developed the first ambulatory device that can rehabilitate stroke patients with gait impairment. And the stroke market is very, very large. In 2006, 890,000 Americans were discharged with a diagnosis of stroke – 606,000 in people over the age of 65, and 236,000 between the ages of 45 and 64. Average length of stay (LOS) ranged from 4.8 to 5.1 days. In 2005, approximately 5,839,000 Americans had a history of stroke, about 50% of whom suffer gait disturbances that limit their ambulation and place them at sharply increased risk of falls. Escalating rates of obesity and Type II diabetes have led many researchers to forecast a “stroke tsunami” in the coming decade. Only the Tibion Bionic Leg offers millions of chronic stroke survivors the potential to regain lost mobility – and a reason to return to therapy. Rehabilitation hospitals. Tibion believes that approximately 2000 freestanding U.S. rehabilitation hospitals represent the greatest opportunity for its commercialization efforts. Often admit acute-stroke patients directly from ambulance transport, when reimbursement can equal $15,000/day. Justify their higher reimbursement and retain patients for post-acute inpatient rehab by acquiring and promoting the latest rehab technology. Enjoy a volume of managed care and Medicare stroke inpatients and outpatients that justify purchase of multiple Bionic Legs. Represent excellent prospects for encouraging patients to rent a planned home Bionic Leg. Skilled nursing facilities. Roughly 15,000 skilled nursing facilities (SNFs) often compete with rehab hospitals for residential stroke rehabilitation – if they have technology like the Bionic Leg. When stroke patients leave an acute-care hospital for residential rehab, patient families often receive several qualified SNF referrals from a discharge planner or case manager – and the family must visit each and select a provider. SNFs often use technology as a competitive tool to persuade families to bring patients to their facilities. Medicare Part A fully pays for 20 days of residential rehabilitation at an SNF, after which patients can elect to pay a $137/day copayment for up to 100 additional days. SNF technology not available at local outpatient rehab clinics can persuade SNF patients pay to remain for many days beyond the 20 Medicare-paid days. Other candidate Bionic Leg customers include 715 accredited U.S. stroke centers, 153 Veterans Administration hospitals with rehab facilities, and 895 smaller VA rehab clinics. Tibion is now testing a new “pay-as-you go” billing system that holds the potential to make the Bionic Leg available to an even wider range of facilities, including thousands of small private clinics with only a few stroke patients a week, and even home care PTs. Tibion is aware of no comparable, wearable robotic stroke rehab devices marketed or reported in development anywhere in the world. The closest robotic device in use for stroke gait therapy is the Hocoma Lokomat, a $300,000 body-weight support system limited to treadmill use. Several exoskeleton devices – essentially, “vertical wheelchairs” – have been developed for spinal cord injured patients and for certain military applications. The Bionic Leg is protected by a battery of patents and proprietary software technology. In addition to planned enhancements and a home version of the Bionic Leg, Tibion anticipates development of upper extremity robotics that will consolidate its position as a robotic rehabilitation leader. I have seen stroke victim's undergo lengthy and very painful rehabilitation. My mother had a stroke, and it was very painful for her just to bend her leg, let alone walk. Thankfully, she was able to walk again. 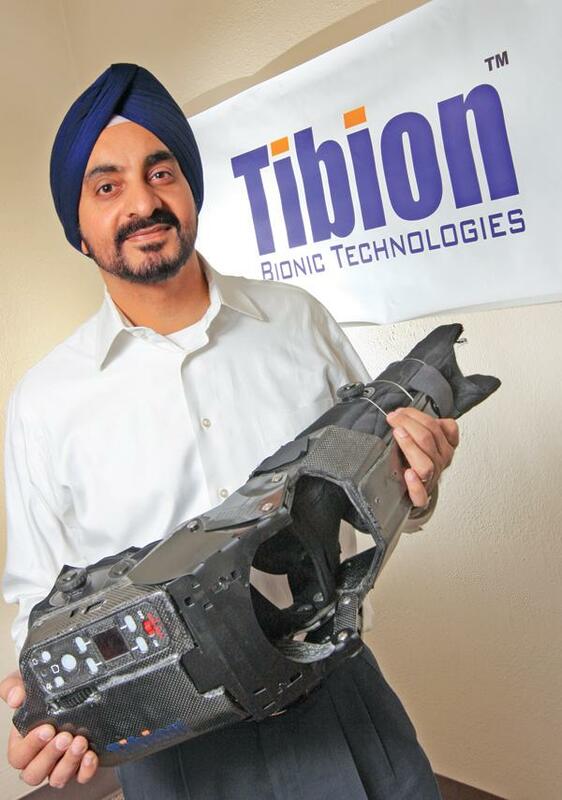 Tiobion's bionic assisted-walking device definitely fills a serious need in the healthcare industry, not just for stroke victim's, but for post-operative knee joint patients. This one is a no-brainer for a VC. Scientists are on the brink of radically expanding the span of a healthy life. Author Sonia Arrison on the latest advances—and what they mean for human existence. In Jonathan Swift's "Gulliver's Travels," Gulliver encounters a small group of immortals, the struldbrugs. "Those excellent struldbrugs," exclaims Gulliver, "who, being born exempt from that universal calamity of human nature, have their minds free and disengaged, without the weight and depression of spirits caused by the continual apprehensions of death!" But the fate of these immortals wasn't so simple, as Swift goes on to report. They were still subject to aging and disease, so that by 80, they were "opinionative, peevish, covetous, morose, vain, talkative," as well as "incapable of friendship, and dead to all natural affection, which never descended below their grandchildren." At 90, they lost their teeth and hair and couldn't carry on conversations. Sonia Arrison, author of a new book on longevity, explains how scientific advances are making radical life expansion -- to age 150 and beyond -- a possibility, and what it could mean for human existence. For as long as human beings have searched for the fountain of youth, they have also feared the consequences of extended life. Today we are on the cusp of a revolution that may finally resolve that tension: Advances in medicine and biotechnology will radically increase not just our life spans but also, crucially, our health spans. The number of people living to advanced old age is already on the rise. 5.7 million Americans are 85 years of age and older, amounting to about 1.8% of the population, according to the Census Bureau. By 2050, 19 million more Americans , or 4.34% of the population, will be added to those 85 years and older, based on current trends. The percentage of Americans 100 and older is projected to rise from 0.03% today to 0.14% of the population in 2050. That's a total of 601,000 centenarians. But many scientists think that this is just the beginning; they are working furiously to make it possible for human beings to achieve Methuselah-like life spans. They are studying the aging process itself and experimenting with ways to slow it down by way of diet, drugs and genetic therapy. They are also working on new ways to replace worn-out organs—and even to help the body to rebuild itself. The gerontologist and scientific provocateur Aubrey de Grey claims that the first humans to live for 1,000 years may already have been born. The idea of "conquering" aging has raised hopes, but it has also spurred a debate about whether people should actually aspire to live that long. What does a longer-living population mean for relationships and families? How can we afford to support massive numbers of aging citizens, and how can individuals afford to support themselves? Won't a society of centenarians just be miserable, tired and cranky? A 2009 study found that restricting calories seems to slow aging in rhesus monkeys over a 20-year period. Both of the monkeys above are pictured at 27 years old. The one on the left (A, B) ate a regular diet. The more robust-looking monkey on the right (C, D) was fed a restricted diet with 30% fewer calories than usual. The scientists working on these issues respond to such concerns by stressing that their aim is not just to increase the quantity of life but its quality as well. A life span of 1,000 may be optimistic, they suggest, but an average span of 150 years seems well within reach in the near future, with most of those years being vital and productive. One key area of research is gene therapy. Cynthia Kenyon of the University of California, San Francisco, found that partially disabling a single gene, called daf-2, doubled the life of tiny worms called Caenorhabditis elegans. Altering the daf-16 gene and other cells added to the effect, allowing the worms to survive in a healthy state six times longer than their normal life span. In human terms, they would be the equivalent of healthy, active 500-year-olds. Experiments with animals are not always applicable to humans, of course, but humans do have the same sort of genetic pathways that Dr. Kenyon manipulated. Other researchers have made similar findings. A laboratory at the University of Arkansas genetically altered worms to live 10 times longer than normal. Spain's National Cancer Research Center found an altogether different way to extend the lives of mice by 45%. Tissue and Organ Regeneration - The Wake Forest Institute for Regenerative Medicine, led by Anthony Atala, has successfully grown bladders in a lab and implanted them in children and teenagers suffering from a congenital birth defect. The basic structure of the bladders was built using biodegradable materials and was then populated with stem cells from the patients, so that their bodies wouldn't reject the transplant. It worked. Today the institute is working to grow more than 30 different organs and tissues, including livers, bone and hearts. With heart disease the No. 1 killer in the U.S., building a human heart will be a major step forward. Doris Taylor announced in 2008 that her cardiovascular lab at the University of Minnesota had managed to grow a rat heart using a technique similar to Dr. Atala's, except that the structure she used was from a donor rat. Dr. Taylor is currently repeating the experiment on pigs. Tissue-On-Demand - Another promising new technology is organ printing, which is exactly what it sounds like: Cells, rather than ink, are put into a sophisticated 3-D printer and then printed onto a biodegradable material. The machine prints "pages" of cells on top of each other to make a three-dimensional shape. In December 2010, a company called Organovo announced that it had successfully printed human blood vessels—an important feature of all organs. Extracellular Matrix (ECM) - At the McGowan Institute for Regenerative Medicine at the University of Pittsburgh, Stephen Badylak is working with "extracellular matrix" (ECM)—the material that gives structure to tissue—from pig bladders. Dr. Badylak has used ECM to grow back the tips of patients' fingers that have been accidentally snipped off, and his colleagues have used it to cure early-stage esophageal cancer by removing the cancerous cells and replacing them with ECM. Scientists don't understand why the substance promotes new tissue growth, and ECM can't yet grow back entire limbs, but results are impressive. Assuming that the necessary technology eventually arrives, the big question is: What will life look like when we live to over 100? One of the most important areas of potential change is family and relationships. With an average life expectancy of 150 years, it's possible that we might see age differences of as much as 80 or 90 years between spouses and partners. But the historical evidence suggests that such disparities in age probably won't be common. Research by Norway's government statistics bureau shows that between 1906 and 2002, life expectancy rose from around 57 years to around 79 years in that country. But the average age difference in relationships remained at around 3.5 years (men being slightly older). One reason for the rarity of relationships with large age gaps is that modern societies tend to look down on them. Will the number of men marrying much younger women continue to grow as people live longer and such relationships become less stigmatized? Research done at Stanford, the University of California, Santa Barbara, and the University of Wisconsin suggests that older men seek younger partners primarily to continue having children. If that is the case, such men won't need to find younger partners once it is easier for older women to have their own biological children using new fertility technologies. And in the future, older women (and men) will likely look less "aged" because they will remain healthy for much longer. Remarriage for beauty or youth will lose some of its distinguishing force. More time to live also raises the possibility of more divorces and remarriages—the seven-year itch turned into the 70-year itch. Today, some people get married two or even three times, but as people live longer, these numbers could increase, perhaps exceeding Liz Taylor proportions for at least a small slice of the population. But greater longevity might also lead to a higher incidence of serial monogamy, regardless of whether it leads to marriage, perhaps interspersed with periods of living alone. As researchers further refine reproductive technology like egg freezing and ovary transplants, the ranks of older parents, currently on the rise, are bound to increase even more. This raises the prospect of families in which siblings are born many decades apart, perhaps 50 years or more. How would such age gaps between children change family dynamics? We know that siblings of the same age cohort have more meaningful and longer-lasting relationships than those separated by more years, but it is difficult to predict how the relationship between siblings born decades apart would function. It probably would be akin to that of a child and an aunt or uncle, or even a child and a grandparent. Living longer would also mean both making and spending money longer. What would an economy look like in which work lives extended into a second century of potential productivity? Most of us already don't expect to retire at 65. The Social Security system cannot afford it even now, and in the future, going out to pasture at 65 will mean decades of boredom. People who live to 150 will use their additional years for second and third careers, and we are likely to see a greater movement toward part-time and flex-time work. It has long been clear that wealth creates health. We now know that health also begets wealth. In a paper titled "The Health and Wealth of Nations," Harvard economist David Bloom and Queen's University economist David Canning explain that, based on the available research, if there are "two countries that are identical in all respects, except that one has a five-year advantage in life expectancy," then the "real income per capita in the healthier country will grow 0.3–0.5% per year faster than in its less healthy counterpart." Although these percentages might look small, they are actually quite significant, especially when we consider that between 1965 and 1990 countries experienced an average per capita income growth of 2% per year. Those numbers are based on only a five-year longevity advantage. What if a country had a 10-, 20-, or 30-year advantage? The growth might not continue to rise in linear fashion, but if the general rule holds—a jump in life expectancy causes an increase in economic growth per capita—then having a longer-lived population would generate enormous differences in economic prosperity. In a 2006 study, the University of Chicago economists Kevin Murphy and Robert Topel painstakingly calculated that for Americans, "gains in life expectancy over the century were worth over $1.2 million per person to the current population." They also found that "from 1970 to 2000, gains in life expectancy added about $3.2 trillion per year to national wealth." The world's advanced societies are finally in a position to launch a true offensive against the seemingly irresistible terms imposed on our lives by disease and death. That's good news for us as individuals and for humanity as a whole. A longer span of healthy years will lead to greater wealth and prospects for happiness. But realizing the full potential of the longevity revolution will not be easy. We will need to tackle important and legitimate questions about the effects of greater health spans on population growth, resource availability and the environment. The decisions that we make in this regard will matter far more than the mere fact of greater numbers. The very idea of radically greater longevity has its critics, on the right and the left. Leon Kass, who served as chairman of the President's Council on Bioethics under George W. Bush, sees the scientific effort to extend life as an instance of our hubris, an assault on human nature itself. The environmental writer Bill McKibben, for his part, strongly opposes what he calls "techno-longevity," arguing that "like everything before us, we will rot our way back into the woof and warp of the planet." I'm unconvinced. Arguments against life extension are often simply an appeal to the status quo. If humans were to live longer, we are told, the world, in some way, would not be right: It would no longer be noble, beautiful or exciting. But what is noble, beautiful and exciting about deterioration and decline? What is morally suspect about ameliorating human suffering? The answer is nothing. Everything that we have, socially and as individuals, is based on the richness of life. There can be no more basic obligation than to help ourselves and future generations to enjoy longer, healthier spans on the Earth that we share. COMMENTARY: I am absolutely amazed at the potential for tissue engineering or regeneration technology to grow new organs and tissues. Those organ printers are really something else. Tissue-on-demand. Patients requiring an organ transplant would no longer have to wait in line for someone to die to obtain a new organ. Many of them now die because there are not enough new organs for those needing them. Organ rejection could be a thing of the past, because tissues taken from the patient's failing organ can be used to regeneratea new organ. The ability to replace every aging organ in the human body is now within reach, perhaps another decade or two. However, was man meant to live 150 years and still be happy? You cannot replace 150 years of culture, and expect someone to adapt to new cultures, accept new music, fashion, and so forth. Get ready for a psychological shockwave. Just how much will people be willing to pay to live to be 150 or maybe 200 years of age. Regenerating new tissues and organs will not come cheap. Only the very wealthy will afford this service. The Six Million Dollar Man will no longer be science fiction, but the real thing. Aging actors and actresses will stay "young" literally forever. Imagine if Marilyn Monroe or Elizabeth Taylor lived today, and looked like when they were in their early 20's. I could not bear the thought that some 150 year old male, who should've been dead decades ago, still looks 30 years old, and have a harem of chicks. Imagine the conversation, "Hey Bush, how things going with you?" He would respond, "Me and Barb are taking a second honey moon, I'm back to drinking and smoking again. Life is good". Bush would ask me, "Hows things going with you Turk?" I would respond, "Say-mo, Say-mo, I'm an old fart now. Retirement home, you know." The technology for tissue and organ regeneration are still in the laboratory. Complex tissues like the heart, brain and spinal column will require more time to develop. The idea of regenerating or printing tissues on a printer layer upon layer, is quite incredible. It is quite possible that tissue and organ regeneration could be commonplace in another decade or two. Just think of the potential and societal consequences. We are telling some, "You will age and die", and saying to those that can afford these new technologies to extend life, "You get to live to be 100. Now write me a check." Maybe Replicants are the answer, as in the film, "Blade Runner". APPLE'S DIRE WARNING FOR IPHONE OWNERS: "KEEP IPHONE AT LEAST 15 MM (5/8 INCH) AWAY FROM THE BODY"
When I say don't put your iphone next to your head it's not my opinion. It's actually stated in the iphone manual. My partner Rob Schuham recently sent me a blog post about the RF radiation and it mentioned that Apple, in the iphone manual, suggests that you keep the phone 5/8" away from your body. I wasn't sure I believed it, this being the web and all. So we pulled out our iphone manual here at the Cottage, and sure enough there it was. Now we have all heard about the potential harmful effects of the radiation coming off our cell phone antennae, but most of us have probably ignored it or just figured it was some sort of technological paranoia. One way or another, I've always laughed it off. But someting about this warning in their manual reminded me of the work I did all of those years on Truth and all of the research into the tobacco companies that came with it. Interestingly enough, the first to begin to suspect that cigarettes were killing people were the tobacco companies themselves. After all, they are most intimate with their product. And their reaction, to avoid liability, was to deny that there was a problem. When there was no way to deny the problem any longer, they shifted to the stance that, "it is a personal decision." Thus moving liability to the user. Well, those tactics were very successful for a very long time, and in some ways you could say that they are still working. As I gazed on the warning within the iphone brochure, I couldn't help but imagine the swirling emails and conversations among the legal team as they crafted this language. As any of you who have worked to get a manual out the door in time knows, this language has been considered very carefully and it has gone through many revisions. And the only reason it would make it into the final document is that the legal minds thought there was a liability issue that they were mitigating. Mitigating risk is their job and it is the job of this document. By "mitigating risk," unfortunately, I don't mean the risk to us the users, I mean the risk of financial liability for the company. This gets my attention. They know something, and it makes me especially concerned for the safety of my children whose brains are said to be more susceptible to environmental assaults. Now what to do with our iphones? Maybe there is a product opportunity here for a case that prevents you from getting the device too close to your head. There goes the slim look - 5/8" is a lot when you think about it. You would need to hold your phone about this far away from your head! Who does that? Has anyone heard that you should do that? It's actually quite weird if you try it. Obviously, talking on speaker or with an earpiece makes sense as a precaution. But the radiation is not present just when you're on a call. It can be strongest when the phone is in your pocket and you're not on it. My phone just officially moved out of my pocket into my messenger bag. Something tells me we are at the beginning of this story not the end. For optimal mobile device performance and to be sure that human exposure to RF energy does not exceed the FCC, IC, and Eropean Union guidelines, always follow these instructions and precautions: When on a call using the built-in audio receiver in iPhone, hold iPhone with the dock connector pointed down toward your shoulder to increase separation from the antenna. When using iPhone near your body for voice calls or for wireless data transmission over a cellular network, keep iPhone at least 15 mm (5/8 inch) away from the body, and only use carrying cases, belt clips, or holders that do not have metal parts and that maintain at least 15 mm (5/8 inch) separation between iPhone and the body. iPhone is designed and manufactured to comply with the limits for exposure to RF energy set by the Federal Communications Commission (FCC) of the United States, Industry Canada (IC) of Canada, and regulating entities of Japan, the European Union, and other countries. The exposure standard employs a unit of measurement known as the specific absorption rate, or SAR. The SAR limit applicable to iPhone set by the FCC is 1.6 watts per kilogram (W/kg), 1.6 W/kg by Industry Canada, and 2.0 W/kg by the Council of the European Union. Tests for SAR are conducted using standard operating positions (i.e., at the ear and worn on the body) specified by these agencies, with iPhone transmitting at its highest certified power level in all tested frequency bands. Although SAR is determined at the highest certified power level in each frequency band, the actual SAR level of iPhone while in operation can be well below the maximum value because iPhone adjusts its cellular transmitting power based in part on proximity to the wireless network. In general, the closer you are to a cellular base station, the lower the cellular transmitting power level. iPhone’s SAR measurement may exceed the FCC exposure guidelines for body-worn operation if positioned less than 15 mm (5/8 inch) from the body (e.g., when carrying iPhone in your pocket). COMMENTARY: On October 16, 2010, in a blog entry titled, "Scientists Say Cell Phones Emit Electro-Magnetic Radio Waves That Can Damage Your Brain, Cause Tumors", I warned everybody about the potential damage cell phones could cause to your brain. No need to worry though, Pong Research has developed a cell phone radiation guard and their site has a very alarming video of cell phone electro-magnetic radio waves before and after using the guard. Thanks Alex Bogusky for echoing my concerns.